You may be admitted to the Ph.D. in Engineering Program after satisfying the admission requirements set forth by the Graduate School, including a record that indicates the potential for a career in engineering research as evaluated by the program's admission committee. You should come to the program with a good understanding of engineering fundamentals. If you are an international student, you must have completed the M.S. degree to be considered for the program. To apply to the Ph.D. in Engineering Program, submit an online graduate application to the Graduate School. If you have any questions about the application, contact the Graduate School. The hours counted towards the master's degree will not exceed 30 hours. In addition, the 60-hour residency requirement must be met. 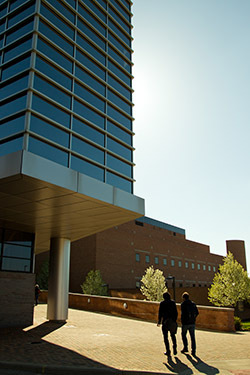 Upon the recommendation of the student's dissertation advisor and the approval of the program director and the Graduate School, graduate courses completed at another accredited academic institution may be transferred to a student's graduate academic record and applied toward the requirements of the student's Ph.D. degree program at Wright State. The credit to be transferred has not been applied toward an awarded degree. While credits that were applied toward an awarded master's degree are not eligible for transfer credit, they may be used, with program approval, to waive certain course requirements. The sixty-hour residency requirement must be met. The student's dissertation advisor and focus area chair review the transfer of credit request and recommend the course(s) to be accepted for transfer credit. The student was admitted and enrolled as a graduate student at the institution where the graduate credit was completed. In addition, the student must be or have been in good standing at that institution. The student may have up to 30 quarter hours of applicable graduate transfer credit posted on their Wright State academic record. If you need financial support, you have several options to explore. A limited number of graduate assistantship positions are available each year.